Our house smells like Christmas today! We made some stained glass Christmas cookies, one of our favourite Christmas activities. 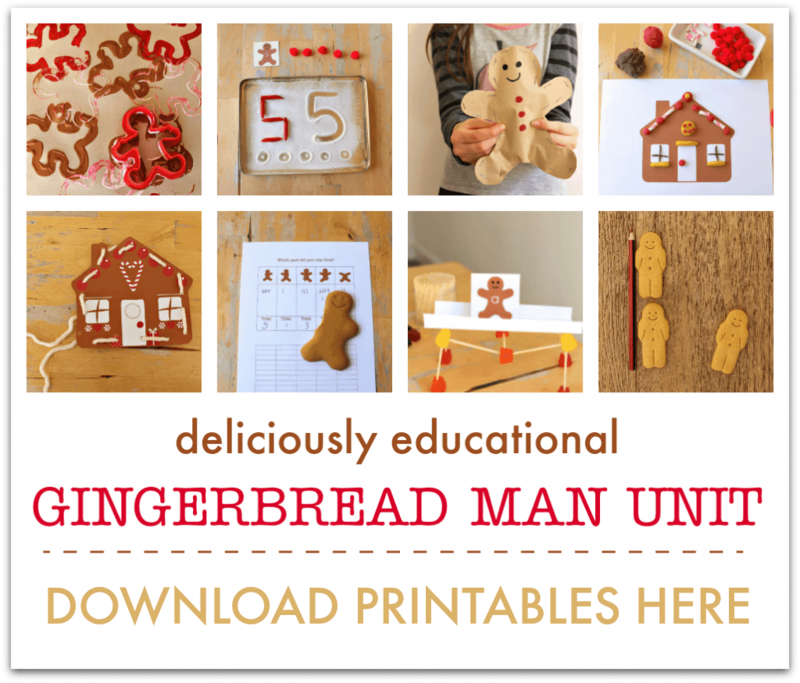 They are easy to make using my basic gingerbread recipe (see below for a few adaptations) and look amazing. 1. Preheat the oven to gas mark 5 / 190 C and grease two baking trays with butter. Get your ingredients ready. 2. 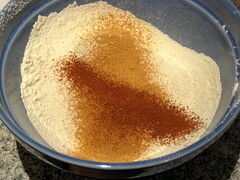 Sift the flour and spices into a bowl. 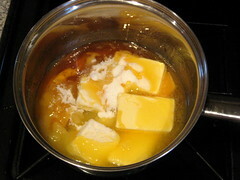 3.Heat the butter, sugar and golden syrup in a pan, but don’t let them boil. 4. 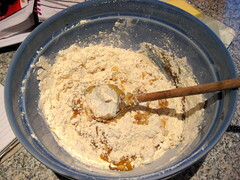 Pour the butter mix into the flour and spices. 5. 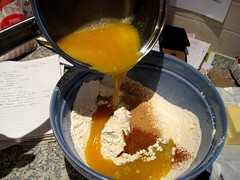 Dissolve the bicarbonate of soda in the water and add to the mixture. Stir the ingredients together. 6. 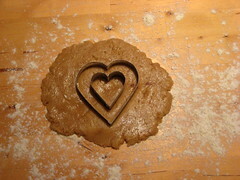 Knead it into a ball and then roll out on to a floured surface. 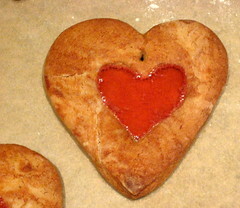 Cut out a large heart shaped cookie. Then cut out a small heart shape from the centre of the big heart. 8. 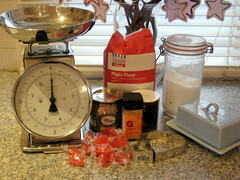 Bake until golden (time will depend on how big your cookies are, but check after 10 minutes). Hey presto the boiled sweet has melted to create your stained glass window. 9. 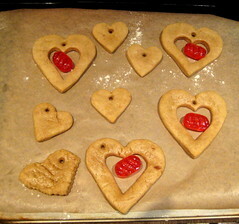 When they come out of the oven check to see that the hole is still there (the cookies will spread a little while cooking) and make the holes a little bigger if you need to. You can sprinkle on some sugar while they’re still warm to give a frosty look if you want to. Leave the cookies to cool completely on the baking paper and then gently peel the paper off. Add a ribbon and hang them on the tree or in your window. They make lovely presents too – wrap in cellophane and tie with a ribbon. If you’re hanging them on your Christmas tree try and position them so a fairy light shines through the ‘glass’ – they’ll look beautiful and smell wonderful! 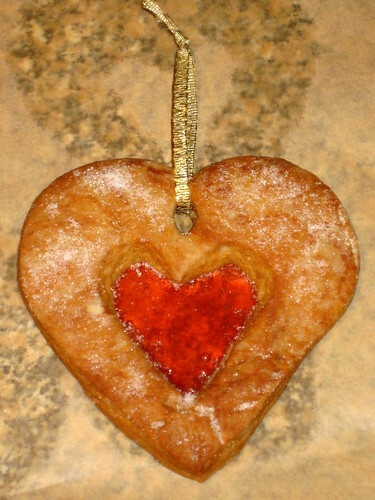 I’ve always wanted to make stained glass cookies, but never have:( Yours look so beautiful! I love ’em! Happy New Year! I love these!!! I tried to make stained glass ornaments this year and they were a major fail! 🙂 You’ve convinced me to try again next year! Thanks for your comments – lovely to hear from you. You should definitely try these, they’re so easy. Thanks angelsandurchinsblog – I like things that look great but are easy! Wow Cathy! These are VERY clever! I think I am going to have to try them with Red Ted! How beautiful and what a wonderful idea! These are definitely on my list of things to do. Would love for you to join us at the Hugs and Kisses Valentine’s Party! I’m just wondering what boiled sweets are? There might be a language gap, I’m in Canada and not familiar with that. Thanks for the great idea! Hi Tami. After having written this site for years I thought I knew most of the UK/US/Canada translations, but I never thought about others not knowing what boiled sweets are! I guess you might call them hard candy? I had that question, too! These are beautiful and I can’t and I will definitely be making them. 😁 Another question:. Is “golden syrup” what’s called corn syrup in the States? If so, would it be the Light kind or the Dark? Hi Kimberly. Yes, I think you can use corn syrup instead and I’d guess it would be the light kind. Let me know how they turn out!